This is a 2007 post, preserved here for archival purposes. Many people wrongly believe that the only way they will be affected by global warming, will be through a tiny sea level rise over many decades. But there are at least ten dangers of global warming. Events that to many may seem to be unrelated, can combine to make things progressively worse, with one danger feeding and reinforcing the next one. Let's have a look at the many concerns and dangers associated with global warming and the resulting changes in climate around the world. I've tentatively grouped them into ten points. We've all seen the pictures of disappearing glaciers and the predictions of rising sea levels. Most people live close to the sea, but many are in denial about the impact of global warming. They falsely believe that the only change that will affect them will be a tiny rise of sea level over many decades. But without action on global warming, weather events will become increasingly extreme. 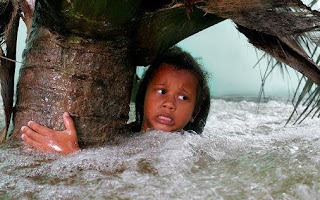 And without government action to move people to newly-built cities, they will continue to live on land most prone to flooding and most exposed to tsunamis, hurricanes, cyclones, tornadoes and thunderstorms, until a disaster hits them like we've seen happen in New Orleans. The task ahead is many scales larger than the evacuation of New Orleans, which after all occurred in the richest nation on Earth while all other infrastructure in the U.S. was in good working order. Ironically, global warming comes with increased risks not only of flooding, but also of shortage of water. Many areas could be hit by droughts, especially once glaciers that previously fed rivers have disappeared. We can also expect more droughts as the weather becomes more turbulent, while the occasional heavy storm wouldn't give much relief, but instead cause landslides, erosion and run-off of top-soil. Heatwaves and shortage of potable water cause dehydration and heat stroke in people and livestock, making them more vulnerable to diseases. Lack of rain and irrigation results in loss of stock and crop, and increases risks of wildfires. 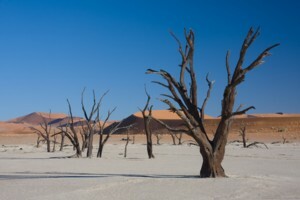 As people and animals move to more fertile grounds, overgrazing of land and clearing land of trees could cause desertification there as well. All this, combined with the increased risk of flooding, should increase concerns for famine and disease. Higher temperatures will increase the risk of tropical diseases, such as malaria, in previously temperate zones. 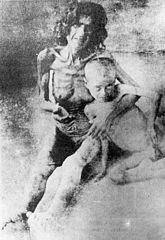 Starvation is one of the biggest unconscious human fears that may well become a reality that is daily displayed on TV. The most fertile land is typically located just above sea level, where rivers enter the sea. Due to climate change, many areas will need to switch to other crops. This will take time, further contributing to transitional if not permanent shortages of food everywhere. Food storage and distribution will be hit by rising cost of cooling, while stored food will become exposed to pests and diseases in the face of increased humidity and in the absence of adequate refrigeration. Cost of transport will rise, while many roads may become inaccessable due to flooding and storm damage. Migration will stress the infrastructure of many cities, even if they weren't affected much directly by climate change in terms of famine, droughts, epidemics, flooding or storm damage. Apart from this, people will also be driven away from many areas by pollution, heat, pests, diseases, shortages of water and supplies, and collapse of infrastructure, medical care and security. Many people will seek new habitats, while at the same time many countries will seek to stop refugees from crossing borders. Refugee camps are notorious for the outbreak of epidemics, such as cholera. Without proper planning and action, this could result in human tragedy at unprecedented scale, while refugee camps could become breeding grounds for new diseases like avian influenza. 5. Collapse of the financial system. The value of money used to be linked to gold, but now is based on economic growth, value of real estate and the value of stock (company shares) and the like. As such factors become increasingly exposed to the the above points, the entire global financial system risks collapse. 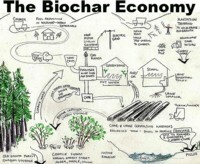 Instead, carbon-based local currency may take over to some extent. Uncertainty about this increases the risk that governments will simply become more dictatorial. In the absence of market forces to guide developments, there will be increased risks that such dictatorial governments take actions that make things worse, resulting in total economic collapse. Many countries face uncertain futures, as they are dependent on income from oil, coal, tourism or a single crop that cannot survive climate change. As an example, air travel could become too expense for tourists, taking away the single biggest revenue stream for many small countries. Entire industries, such as manufacturing of cars and airplanes, may collapse. Globalisation has made many industries dependent on access to resources and products that come from halfway around the world, while the cost of transport is likely to go up. Again, such economic collapse may set the scene for dictatorship in many areas, increasing the risk of war and of wrong decisions being taken in general. 7. War and civil unrest. The above points should increase our concerns about the risk of wars and civil unrest. Production of weapons is one of the biggest industries worldwide, with the clout to influence governments. The oil industry is often regarded as the most powerful influence of global politics. Some countries will want quick and dramatic changes, while other countries may resist all calls for change or may want entirely different changes, setting up confrontation at a global scale and setting the scene for World War III. Within most countries, there will also be opposing groups. The smartest people, who we now need more than ever, may be killed, may end up in prison or may otherwise be silenced, while dictators seek to grab power without any intention of solving the problems. 8. Pollution, in particular as a result of nuclear war, fallout and waste. As concerns about emissions of carbon and methane increase, industry may - in efforts to avoid emissions of greenhouse gases - cause other types of pollution instead, such as soot and sulfur by diesel engines. The air will get more polluted in cities, as their population and traffic grow. Global warming causes hot summer days to get hotter, especially where there are Urban Heat Islands, increasing ground-level ozone, which exacerbates smog. 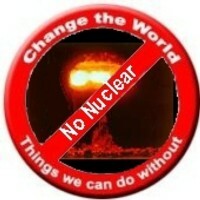 The nuclear industry may present itself as a "green" alternative, whereas nuclear fallout and waste should count as some of the biggest pollution dangers. As concerns about carbon emissions sink in, more countries may consider using nuclear power for electricity, despite its high cost, while many countries may seek to develop nuclear weapons in response to perceived increased risk of war in the light of the above points. The secrecy under which such development takes place gives cause to concern about global safety and security. 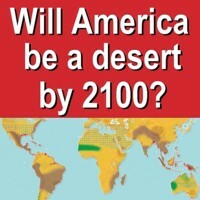 Will America be a desert by 2100? One of the biggest dangers is that, without dramatic action, Earth will reach certain tipping points beyond which sudden dramatic and catastrophic changes take place that are irreversable in the short term. Droughts and fire could destroy the Amazon. The Arctic may lose all of its sea ice within years. Global warming may cause earthquakes, which can come with tsunamis and shockwaves that can also disturb submarine hydrates, causing them to release huge amounts of methane. While droughts, earthquakes and more turbulent weather come with loss of lives, infrastructure and fertile land, global warming can also cause tipping points to be crossed, making the greenhouse effect even worse. So, instead of facing gradual changes that can be mitigated by planned action, we may suddenly face a future in which many if not most people will have little or no access to food, water, medicine, electricity and shelter, while diseases go rampant and gangs and warlords loot and devastate the few liveable areas left. Human beings as a species will face the risk of total extinction, particularly if many species of animals and plants that humans depend on will disappear. While each of the above points is sufficient reason for concern, many people are still in denial about the severity of the problem of global warming, the accumulation of dangers and their progression. Once they do get the message, though, there's a risk of over-reaction edging into panic. This may result in people buying up all the food they can get hold of, trying to get their hands on weapons, etc. Unscrupulous companies may exploit the situation by deliberately creating scarcity of medicines, etc. This is another reason to be open about these concerns and to come up with planning that makes sense. 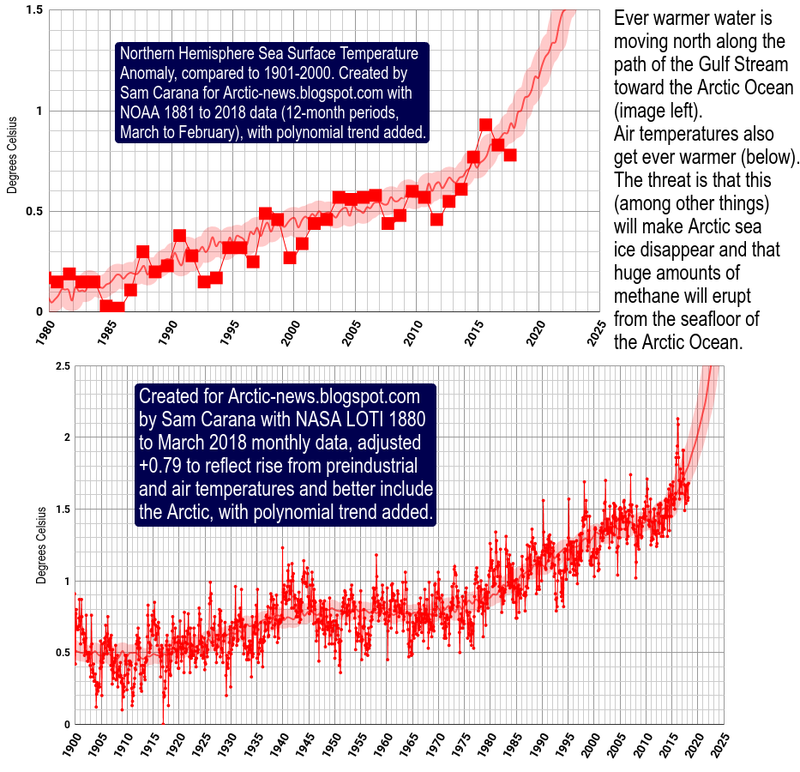 Background: This is an illustrated version - with minor edits - of the original March 7, 2007, post that was followed by the April 8, 2007, post Ten Recommendations to deal with global warming. By early 2013, these two posts, together with another 2007 post at Gather (on the Hydrogen Economy) had been viewed by some 100,000 individual visitors. The situation in the Arctic is desperate, sea ice north of Greenland is collapsing, yet mainstream media do not seem to care. 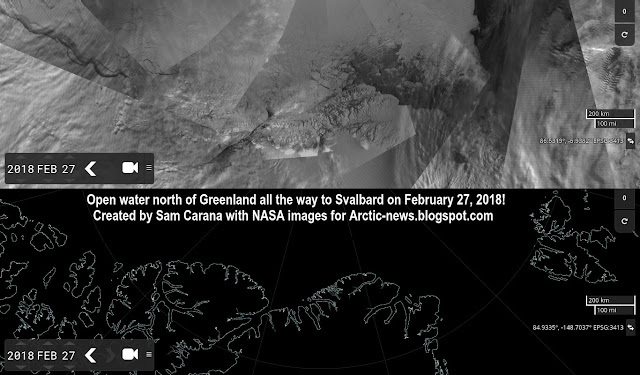 The image shows open water north of Greenland all the way to Svalbard, on February 27, 2018! For years, I've been warning about the situation in the Arctic, in particular the 'Open Doors Feedback', which is accelerating Arctic warming. 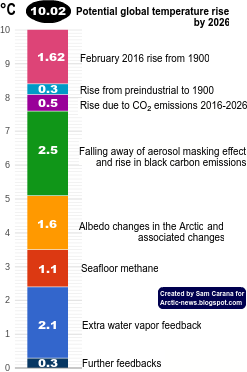 Such feedbacks were taken into consideration in the analysis that warned about a potential 1.6°C warming globally due to albedo changes in the Arctic alone, i.e. in combination with associated changes such as loss of the ice buffer (latent heat), more heat transfer from the Atlantic Ocean to the Arctic Ocean due to stronger winds along the path of the Gulf Stream, and more heat entering the atmosphere or remaining in the atmosphere, due to more open water in the Arctic Ocean and as oceans get more stratified and take up less heat from the atmosphere. So, the current situation doesn't come as a big surprise, but it's stunning to see sea ice collapse north of Greenland in February. 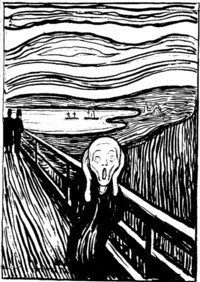 Back in March 7, 2007, I posted the article 'Ten Dangers of Global Warming', describing events getting progressively worse, with one danger feeding and reinforcing the next one, culminating in panic. Then, I thought that reading that post could at least help people better understand what's going on, and thus help people avoid panicking, but right now, I wonder whether most people do want to understand at all. Ten years on and 'Trump' is disabling US Capacity to function as cartel. Earth is heating and it is absolutely by pecuniary violation of 2nd law system isolation for profit without registering cost of consequence Earth. The potential build up of state static energy renders Earth Capacitor Hot.